HyperX has become a favoured name in gaming peripherals thanks to an array of award-winning headsets, but can the Kingston subsidiary continue the good work in other areas? 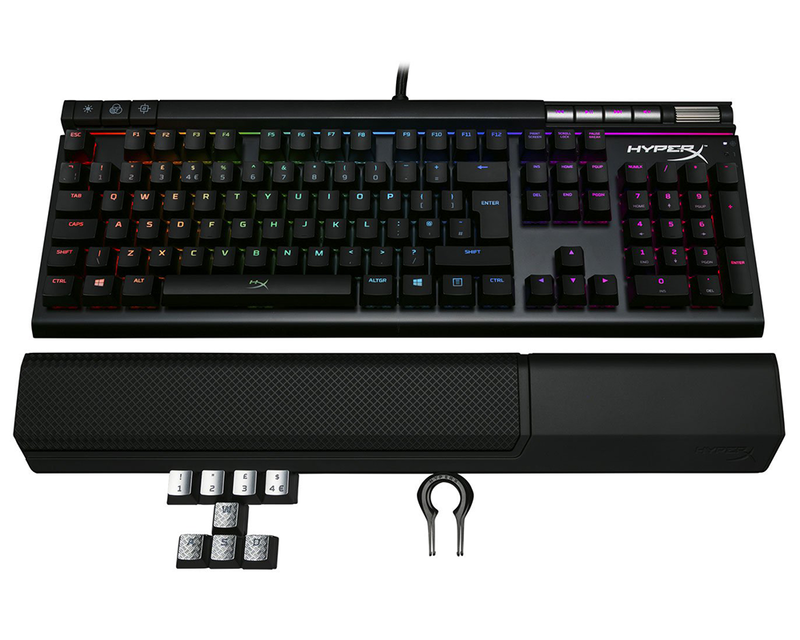 The firm's catalogue of products has steadily grown to include keyboards and mice, and has now been expanded with its first multi-colour HyperX keyboard, the Alloy Elite RGB. 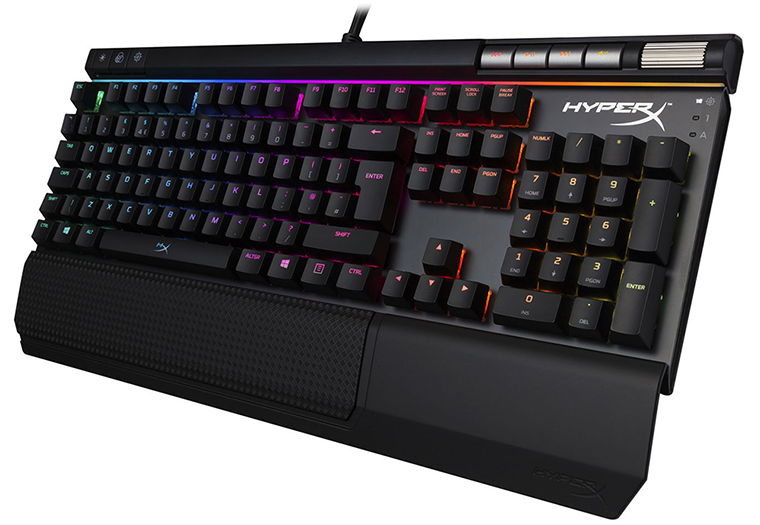 Priced at £150, HyperX's latest is essentially last year's Alloy Elite with the addition of RGB LEDs. A healthy mash-up for fans of the original keyboard craving dazzling light shows, but there is a compromise in the form of a hefty 36 per cent price hike - if basic red backlighting is all you need, the original Alloy Elite remains a more attractive proposition at £110. 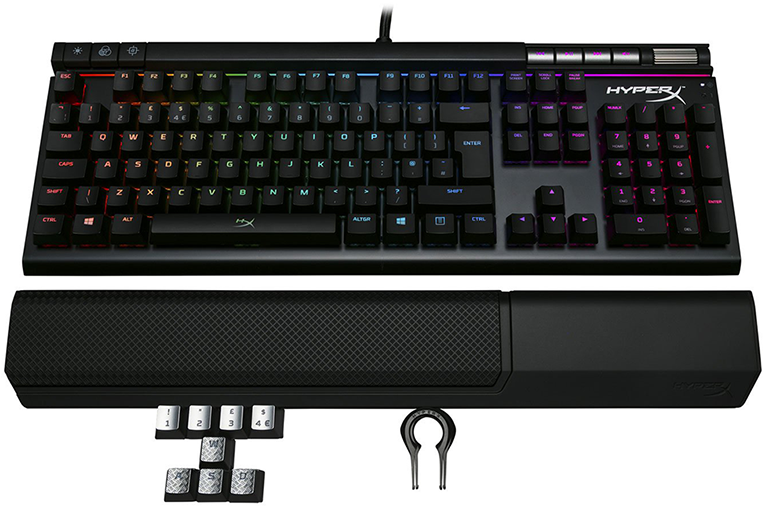 The good news is that HyperX hasn't messed with the core ingredients that make this one of the better gaming keyboards on the market. The aesthetic design, first and foremost, is easy on the eye and doesn't venture too far into gaudy territory. The black paintwork is well done, the silver multimedia keys provide good contrast, the keycap font is inoffensive, and a 45cm width is about right for a keyboard with integrated numpad. Looking the part is all well and good, but the Alloy Elite RGB also feels good in use. The plastic base is topped with a solid steel plate that provides excellent rigidity, the volume roller is lovely and smooth, and Cherry MX mechanical key switches offer a tried-and-trusted response. One potential snag is the detachable palm rest, which despite being topped with a comfortable soft-touch coating, is plasticky and lightweight compared to the keyboard itself. 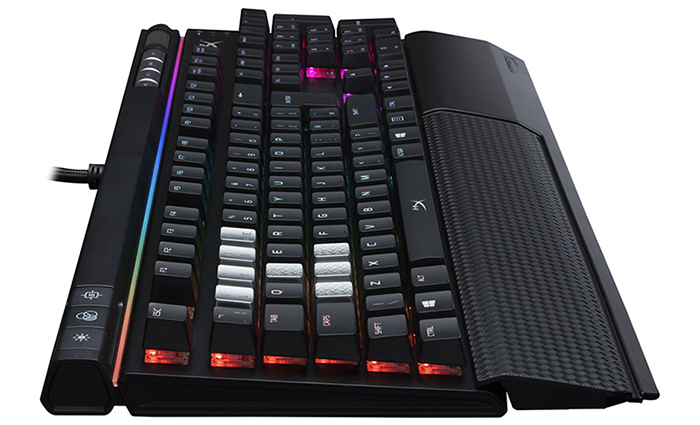 We like the fact that the four dedicated multimedia keys sat alongside the volume scroller are RGB backlit, however the lack of backlight on the trio of quick-access buttons lining the top-left corner is a surprise omission. These buttons include brightness adjustment, profile switch and game mode, and we'd liked to have seen the profile button in particular use lighting to highlight which of the three onboard profiles is currently selected. While we're nitpicking, the Caps Lock LED indicator, to the right of the HyperX logo, is a tad close to the numpad and is hard to see without craning your head over the top. If you happen to be partial to RGB, then note that the Alloy Elite implementation is visually impressive, with one or two caveats. The illumination itself is bright with good representation of colour and a light strip near the top of the keyboard offers a seamless backlight that accentuates the overall effect. The catch? Well, the RGB LEDs are housed near the top of each keycap, resulting in uneven backlighting on keys with multiple functions - !, for example, is noticeably brighter than 1 - and if you're all about customisation, HyperX's bundled software utility isn't yet as robust as the competition. More on that later. In use, Alloy Elite RGB is an enjoyable place to work or play. Cherry MX Red key switches - the only option currently available at UK retail - provide a linear action with no audible click, 4mm of travel and actuation at 2mm. The switch is a known quantity, and a good one at that, plus the HyperX implementation to our ears seems somewhat quieter than most. It is close to being one of my favourite mechanical gaming keyboards, yet when typing there was a slight adjustment period as I personally find the tops of the Alloy Elite keycaps a tad slippy and a fraction more grip wouldn't go amiss. Fortunately, a little extra grip is available via the bundled gaming keycaps. Coloured in silver and textured for easy identification, the keys include WASD and 1234 and are easily installed using the supplied remover tool. Covering the basics, Alloy Elite RGB also includes support for full anti-ghosting and N-Key rollover, while a pair of flip-out feet with rubberised tips help elevate the keyboard and keep it planted. Connectivity is handled by a thick, braided and split USB 2.0 cable that requires two ports on the host PC. 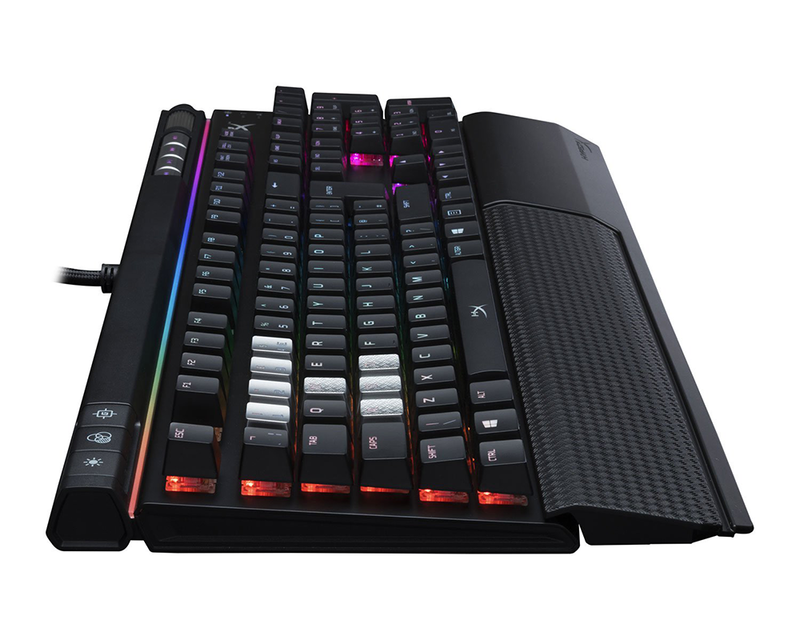 The keyboard does provide a passthrough port on its top edge - useful for connecting, say, a wired headset - but in this day and age, and given the £150 price point, we would like to see USB 3.0 featured as standard.